Egypt’s capitol city, Cairo, is a “must see” stop on traveler’s itinerary. Whether 4 days or just 48 hours, Cairo has plenty to offer for a memorable travel destination. Nicknamed ‘The City of a Thousand Minarets’ for its skyline of mosque towers; Cairo is a hectic city always alive and thriving. It’s the city that never sleeps, though you may need to catch some shut eye after packing in the food, culture and ancient sites that Cairo is known for. Skyline of Old Cairo. Photo: Genevieve Hathaway. Your day will most likely begin in the wee hours of the morning with the Adhan prayer, the first Call to Prayer of the day. It’s sound reverberating hauntingly through the already awake town, echoing off buildings, mosques, and even the Pyramids. After breakfast, hire a car and driver and visit the Giza Pyramids and the Sphinx, one of the 7 Wonders of the Ancient World. Arranging for an excellent local guide will help bring the stunning stone structures to life (as well as keep the throngs of touts and camel guides at bay). Climb around inside Khufu’s the Great Pyramid imagining what it must have been like for ancient explorers to ascend the Grand Gallery to the King’s Chamber with only torches to light the way. Walk around the Sphinx as it stands guard on the plateau. Some archaeologists believe it may pre-date the Pyramids. Also worth a visit are the Solar Boat Museum, showcasing Khufu’s massive wooden solar boats, and the panorama point at the back of the plateau which provides a sweeping view of the Pyramids. Travel tip: You can also visit the inner passageways and chambers Menkaure’s Pyramid and sometimes Khafre’s Pyramid. All pyramids require a separate ticket sold at the main entrance gate. A limited number of tickets are sold each day so arrive early to ensure you can purchase a ticket. Giza pyramids. Photo: Genevieve Hathaway. For lunch, dine near the Giza pyramids at Andrea Restaurant, a poplar local eatery that serves succulent grilled chicken and a wonderful mezze of middle eastern dishes. 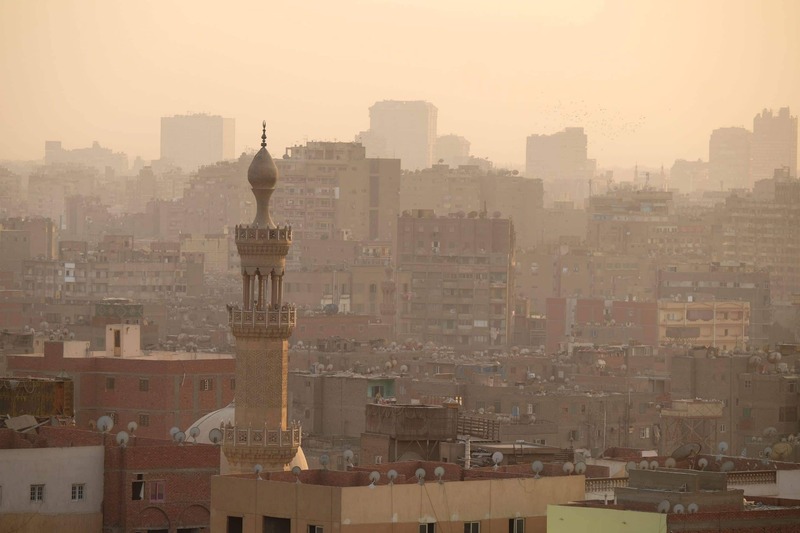 Shift ancient history gears with a visit to Islamic Cairo. Ladies pack your large scarves to cover your head. Remember to dress modestly, high neckline, long sleeves, long skirt or pants. Men too should cover their shoulders and knees. Take in some of the best Islamic architecture at the colossal Sultan Hassan Mosque and the delicately-carved Rifai Mosque. Next enjoy sweeping views of Islamic Cairo high up on the Citadel’s Walls. 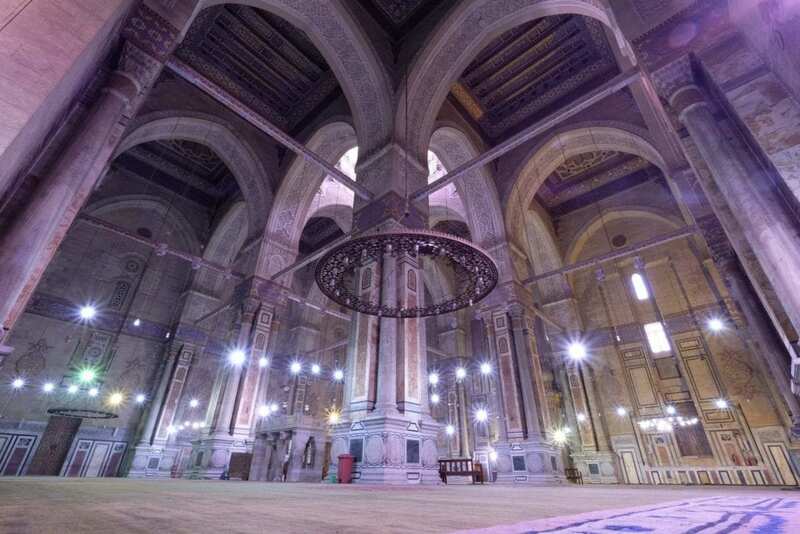 Then explore the famous Ottoman-era Muhammed Ali Mosque. Travel Tip: Photographs are allowed inside Sultan Hassan Mosque, Rifai Mosque, the Citadel and Muhammed Ali Mosque. Show respect – ask before taking pictures of people and no flash. Al-Rifa’i Mosque is one of the prettiest mosques in Cairo. Photo: Genevieve Hathaway. Cruise the Nile at sunset in a traditional Felucca. Then enjoy dinner at Abou EL Seid on Zamalek Island, the top Egyptian restaurant in Cairo. Finish the night with a walk along the Nile cornice or grab a glass of wine at the trendy Cairo Jazz Club. Travel Tip: If negotiating for your own Felucca start with 1/4 of the asking price than work toward 1/2. At a half the asking price, you’ll still be paying more than the locals, but at a closer to expat price. Hotel: For great atmosphere, quality and staff that will make you feel right at home stay at the lovely Kempinski Nile Hotel, located overlooking the Nile. It’s a small, personable hotel with an excellent location in the heart of Cairo. Start your morning with the best brunch in Cairo at the Marriott on Zamalek. Then hop in a taxi to the Cairo Museum. Walk through 3,000 years of Egyptian history in this massive museum that is pack floor-to-ceiling with ancient Egyptian treasures. Get up-close-and-personal with the great Pharaohs of Egypt in the Royal Mummy rooms. Marvel at the treasures of Tutankhamun. Visit Egypt’s earliest dynasties with the mortuary statues of the 1st dynastic Pharaohs. 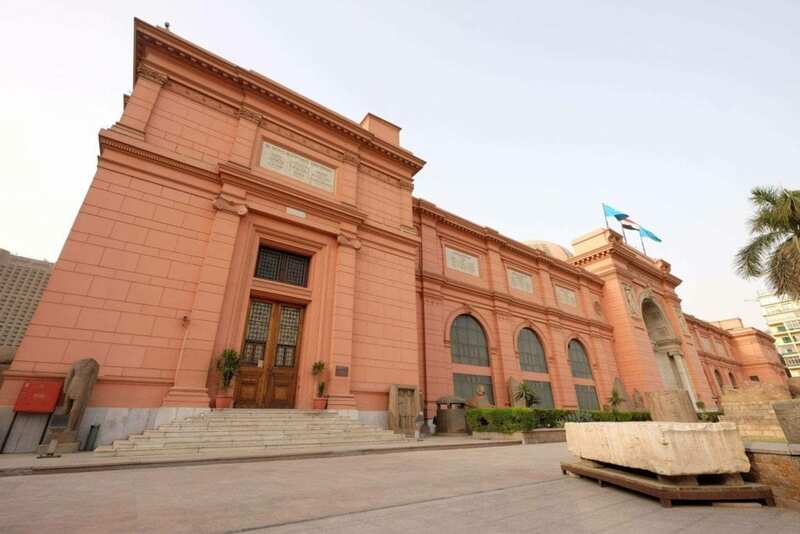 Travel tip: Cameras are NOT PERMITTED in the Cairo Museum. Check your camera to the right of where you purchase your entry ticket. Leave your camera with the attendant in a camera case or padded bag. Don’t leave cash or phones. Upon picking up your camera tip the attend a few Egyptian pounds. Cairo Museum. Photo: Genevieve Hathaway. Enjoy lunch at Taboula Restaurant in Garden City, one of the best Middle Eastern restaurants in Cairo. Then learn about Egypt’s Coptic culture exploring the churches and walled city of Coptic Cairo. Only found in Egypt, the Coptic religion is believed to be one of the earliest forms of Christianity. Archaeologists consider the Coptic language to be derived from the last ancient Egyptian language, Demotic. Travel tip: You will also have to leave your camera here too. It’s becoming common at sites not to allow cameras. Dine for dinner at the memorable Studio Misr overlooking lush Al-Azhar park with stunning views of the Citadel. Enjoy a post-diner sunset stroll through the gardens, tea houses and forested boulevards of Cairo’s top garden and green belt, located in the shadow of the imposing Citadel. 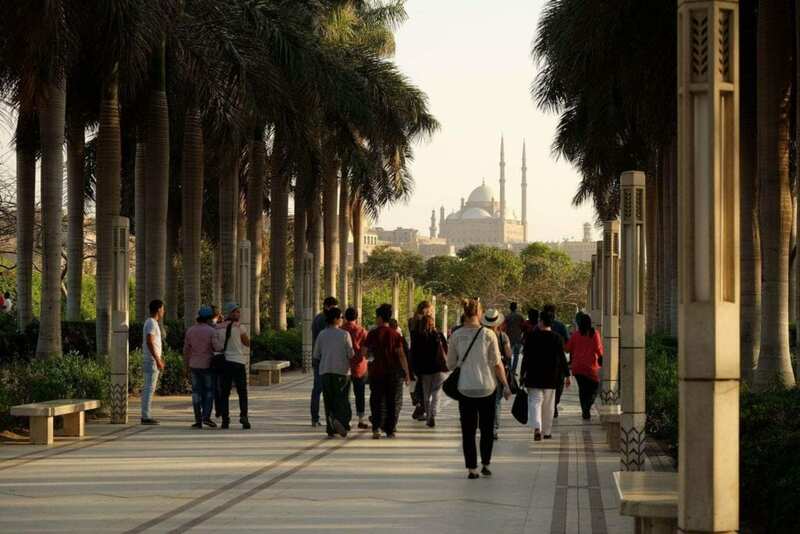 Strolling along the leafy boulevards of Al-Azhar Park is a popular evening activity for local families. Photo: Genevieve Hathaway. Travel tip: ‘Bargain tough. Bargain like my mother,’ locals like to advise travelers. Best time to visit The Kahn is between 9pm and midnight. After this whirlwind 48 hours in Cairo, you’ll be left with a better appreciation of both the modern and ancient cultures. And you’ll be left wanting more – Saqqara, Dahashur, Memphis, Meidum, Alexandria, the Cairo Opera, exploring boutiques on Zamalek, enjoying the nightlife of Maadi, visiting Cairo modern culture and arts centers, catching a lecture at the American University in Cairo, enjoying Cairo’s street eats, much, much more. Cairo is one of the great international cities with something for every kind of traveler. Thanks John for the update! The camera permits change frequently so great to hear they are currently allowed and noted. Thanks John for the great comment! Very true!